Named for: Willoughby John Astley was the first manager of the chalet at Lake Louise. Samuel Allen named Mount St. Piran after the Patron Saint of Cornwall. Astley was born at Perranuthnoe which is located on a bay in the extreme southwest of Cornwall. Edward Whymper, the famous mountaineer who first climbed the Matterhorn, visited the summit and later wrote, "The finest point of view that I visited in this group was the top of Mount St. Piran." He was so impressed with the view that he recommended building a path to the top. 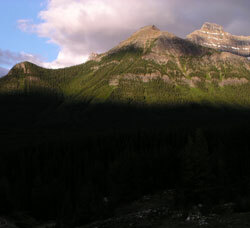 One of the most reknown of the lady climbers to visit the Canadian Rockies during the first half of the nineteenth century, Georgia Engelhard, had a special feeling for Mount St. Piran. She wrote, "The day after my last climb, the day of departure, I got up at 4 a.m. A silver full moon flooded the calm, mirrorlike lake with silver, and silver were the Victoria Glaciers beyond. With my easy loping mountaineer's stride less than two hours brought me to the summit of Mount St. Piran, 3000 feet above Lake Louise. The lake and valley were still in deep shadow, but the surrounding peaks, all I had climbed, were bathed in golden rosy light. I was seized by an indescribable ecstasy, filled with the joy of conquest. They were all mine -my beautiful, private, world of mountains. Yet, at the same time, I felt how infinitesimal I was. It was an unforgettable experience." For a panoramic view from the summit of Mount St. Piran visit www.canadasmountains.com.